The toilet in back of the Washington Street side of the First Christian Church on March 23. Since last fall two churches, United Presbyterian and First Christian, have made available a portable toilet at First Christian as an after-hours service to homeless people. This was in response to problems around the building. There’s a community meal at First Christian on Tuesday evenings for people in need, and some of them stayed on the grounds overnight. 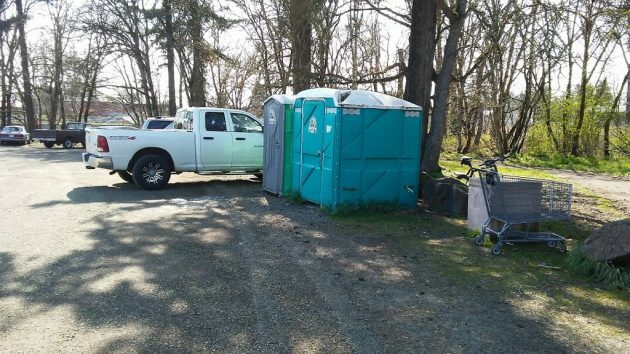 Police had noticed the toilet when they came a few times to roust the campers, and the city’s code compliance officer gave notice in November that it could not stay more than 90 days, until Feb. 14. The city manager denied the churches’ initial appeal because city codes don’t allow for long-term use of chemical toilets. The Democrat-Herald has covered the story from the start. As I’ve read the stories, I’ve been puzzled by the assertion that portable toilets are barred by the municipal code. If that’s the case, I’m wondering, what about the portable toilets at parks such as Gibson Hill, Simpson and Waverly, among others? 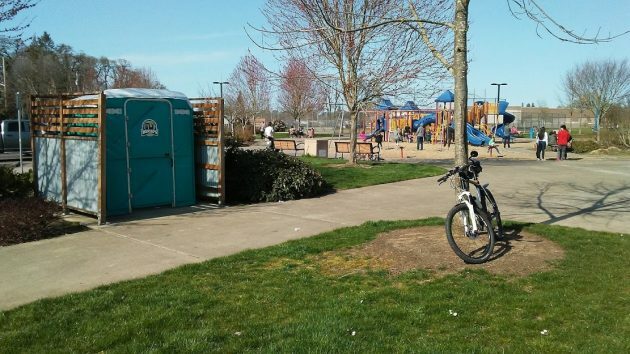 A permanent portable toilet at Kinder Park on March 24. Here are the accommodations at Simpson Park near the Talking Water Gardens. Is it possible that only dependable, God fearing taxpayers qualify to relieve themselves in a plastic cubicle? Look at the Hasso pic! 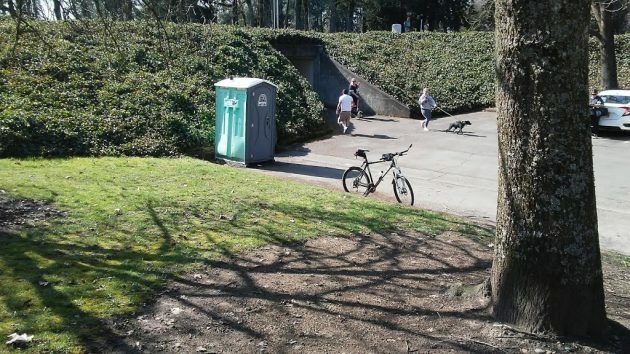 That potty is right up next to a structure. No park setting there. Surely a clear code violation. What is wrong with the plumbing inside this building? Why do the workers inside have to go out to the potty? Much WRONG with this picture. Read the story. The toilet is for homeless people to use after hours. That’s when the church and nearby public buildings are closed. The Mayor is quoted as being opposed to permitting long term siting of chem toilet–“it encourages homelessness”. 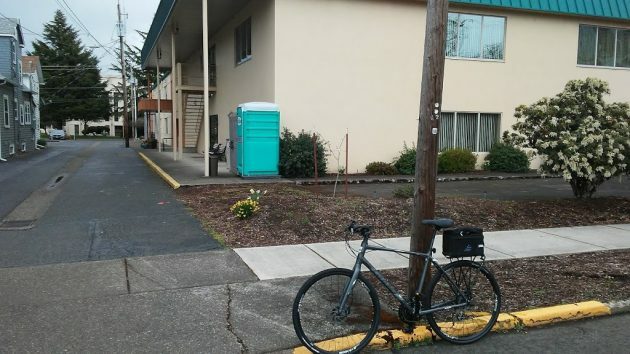 The idea that not having a toilet would encourage folks to not be homeless is nuts. The Churches provide a general benefit to the City–get off their backs–change the arbitrary rule or ignore it. “Build it and they will come”, I see infrastructure, a dog friendly area, an area for a tent. San Fran and Portland send their love. Just sayin. HH my comment about Mayor’s position was as reported in ADH so it is relevant. Apparently the whole Council has not dealt with it but some members did weigh in at a meeting covered by newspaper. Thanks for the cleanup. Things were getting out of hand. What about all the parks that have the permanent restrooms closed for the season, like Bowman Park which has a boat ramp used all year? If it is denied, maybe it could be moved to the nice green lawn across the street that is public property, which would make it similar to being at a park.